Farming with Grandpa | Winners Drink Milk! It’s no secret I am passionate about the dairy industry. After all, this industry has given me so many joys and opportunities over the years. However, none of it would be possible without one special man in my life—my grandpa. So many of my favorite memories over the years involve our farm, showing dairy cows, and of course hanging out with Granny and Grandpa. Last year, I told you about some fun memories with Grandpa on the farm. This year, Grandparents Day is even more special to my family. Although Grandparents Day is celebrated on September 9th this year, it’s a weekend celebration for us. 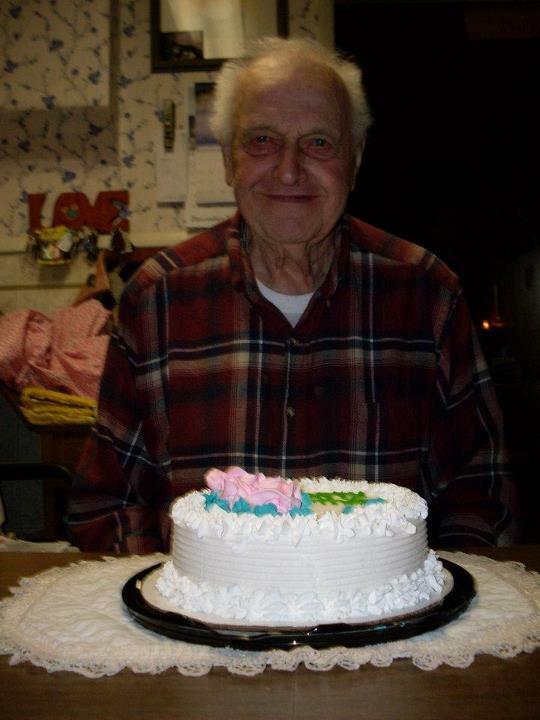 September 7th is Grandpa’s 90th birthday. Talk about a reason to celebrate! Grandpa may be 90 years old, but you wouldn’t know it by looking at him. He still chops wood, helps when people come to the farm to buy hay, feeds cows and does other chores around the farm. He amazes and inspires me. Even more than that, he gave my brother and me the best gift possible: a love of farming. Hay season and the cows always bring our family together. That’s just one thing I love about farming, its ability to bring several generations together. My brother and I are the 4th generation of Johnson farmers and although I don’t live on the farm anymore, there’s no place I’d rather call home. Growing up, summer meant hay season. And hay season meant several uncles, my brother, Grandpa and many other family members were out in the field driving tractor, bucking and stacking hay, and doing whatever else needed to be done. I know I would not be who I am or have the passion that I do for agriculture without Granny and Grandpa. They are truly two of the most inspirational people I know. This Sunday, I hope you will join us as we celebrate Grandparents day. What are some of your favorite memories with your grandparents?